Eleven women attended this month’s meeting at Clarabel Marstaller’s new place at McLellan House. The card ministry was completed, and we enjoyed a program from the Blue Print book. This month’s program was a reprint of a program from the 1950-51 Blueprint book. The program was written by Milton Hadley who was Clarabel’s father and a past minister of Durham Friends Meeting. He wrote about a woman who spoke about her mental perspective as a Holocaust survivor and how she experienced freedom in her closeness to God during that time. Milton spoke about how we often need to reframe our experiences, and good or bad, it is not so much our experience as our response to them. Clarabel also shared her experiences related to the period just after WWII and how her family was involved in the resettlement of refugees from Europe and Japan. In business, we filled out the program calendar for the remainder of this year, reviewed and accepted Treasurer and Secretary reports from last month, and decided that we need to update the Tedford team list. Angie will work on the outline and write an article for the newsletter. We will finalize the changes at next month’s meeting. Prayers were requested for Shawn and Katrina McConaughey, the new program officers for Friends United Meeting Africa Ministries Office in Kisumu, Kenya, and for Dale and Sylvia Graves who are experiencing a difficult time right now. The Tedford meal for February was turkey, gravy, cranberry sauce, frozen veggies, and brownies. We were reminded that Woman’s Society is hosting the women of United Society of Friends Women of New England on June 10 with an after-Meeting potluck. 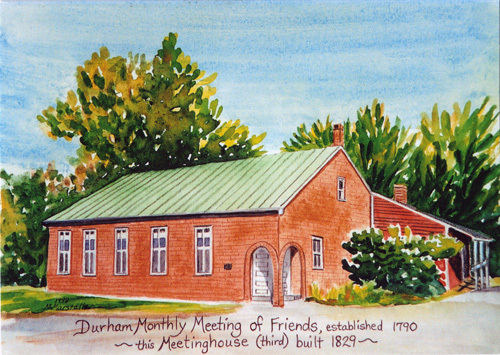 We also decided to have a Silent Auction at our April meeting which will be at the Meetinghouse. The meeting ended with a poem read by Dorothy Curtis and we enjoyed refreshments provided by Nancy and Clarabel. The next meeting is on March 20 at Gene Boyington’s home with Theresa Oleksiw hostessing.